Comes in a plastic pouch with a laminated printout of the story. Also includes two other duckling stories. When you’re working with children, making education a fun experience is essential! Puppets are a great medium to do this. Set includes 1 Alligator glove and 1 glove with 5 detachable monkeys on it. 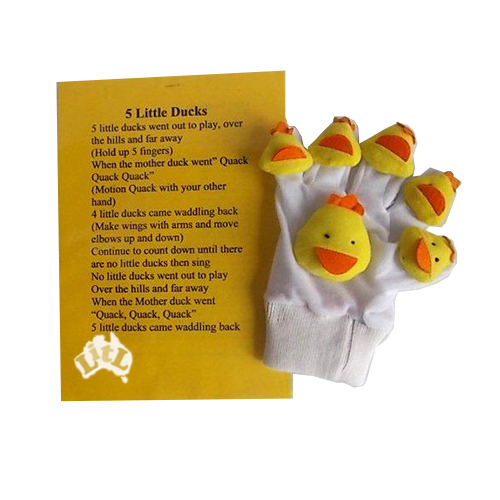 set includes 1 Mother duck glove and 5 little duck finger puppets. set of 4 puppets. Printout of story included. Set includes Old Mac, a tractor and 5 animal puppets. Set of 4 puppets. A classic oldie, loved by children of all ages. This a glove puppet with Ladybugs attached, it comes with a laminated printout of the story.